"...school can...bring people together...kids of all races and backgrounds." On the morning of her first day at William Frantz Elementary School in New Orleans, Ruby Bridges' mother told her: "Now I want you to behave yourself today, Ruby, and don't be afraid." Ruby and her mother went to the school where so many people were outside shouting and throwing things that the little girl thought it must be Mardi Gras. She seemed to be remembering her mother's words as she entered the school without showing any fear at all. Despite the fact that it was 1960, there were U.S. marshals walking beside her, and she was the first black child to enter an all-white school in the history of the American South. It was in 1960 that a federal court ordered the desegregation of schools in the South, and although Ruby Bridges' father thought she could get a perfectly good education at an all-black elementary school, Bridges' mother insisted that her daughter pave the way for other black children in the newly-integrated school system. Charles Burks, one of the U.S. marshals who escorted Bridges and her mother into the school building, remembers the little girl who became a hero. "She showed a lot of courage. She never cried. She didn't whimper. She just marched along like a little soldier. And we're all very proud of her." The first year, all the parents of Frantz Elementary pulled their children out of school to protest the integration. As a result, Ruby Bridges spent her first year in a class of one. The teacher, a woman from Boston, was one of the few white instructors who was willing to teach a black child. She and Bridges showed up for school every single day that year, and they held class as if there were no angry mob outside, no conflict over a little girl attending first grade. Bridges family suffered from the bigotry of the times. Her father lost his job as a result of the controversy, and her grandparents lost their place as tenant farmers. The Bridges gathered together, and friends would come in the morning to help Ruby get ready for school, or to walk with her to her classroom. By now, nobody can deny the heroism of Ruby Bridges, whose bravery inspired the 1966 painting by Norman Rockwell entitled "The Problem We All Live With." 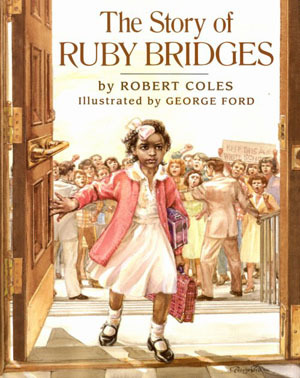 It also inspired the children's book The Ruby Bridges Story by Robert Coles. She has demonstrated the value of education to countless others. Bridges, who is now 44 years old, has devoted herself to the education of the young. She raised her own four sons, her brother's four daughters, and started the Ruby Bridges Foundation "in the hopes of bringing parents back into the schools and taking a more active role in their children's education." Through My Eyes - gives Ruby a chance to tell her story. Ruby Bridges - is another MY HERO piece on Ruby Bridges, written by Candice from Westminster. Ruby Bridges Hall spoke at the Harvard Divinity College. She has written a book about racism from childrens' points of view. Ruby had to be walked into school by five federal marshals to make sure that white people wouldn't try to hurt her. Her mom would walk with her to school, too. White parents took their childern out of the school until Ruby stopped going to the white people school. But Ruby did not stop going to the school. Ruby's teacher was Ms. Barbara Henry. Ms. Henry liked Ruby very much. Ruby was the only child in her class. Ruby Bridges was born in the South, in New Orleans, La. She is black. She had a great mom and dad. She had three sisters and one brother. Her family loved her so much. The lesson we learn is it does not matter what color you are. Ruby never gave up. I think she was a brave little girl. Ruby got an education even though people said she couldn't.